1. Life experience – there’s no denying that this is the industry to be in if you want to see the world, meet new people and explore new venues. Whether you’re exploring the world as a member of cabin crew, working in a resort for a tour operator, planning events in exciting locations, running a top-end hotel or working in an airport, you’ll get to meet people from different walks of life and visit some of the best places in the world. 2. Long-term opportunities – some of the largest companies in the world operate in this sector (think Virgin, Tui and Festival Republic). If you’re willing to work hard and put the skills you learn to use, you could have a job for life. 3. Every day is different – as an event planner you could be doing anything from visiting venues to dealing with caterers or designers for invites. As a member of cabin crew you could be travelling to, and exploring, different places in the world every week. You could even be re-booking cancelled flights or selling the many highlights of a tropical island as a travel advisor. If there’s one thing we can guarantee in this industry it’s that it will never be boring! 4. Learn skills for life – in the aviation, tourism and events industry you’ll gain skills that employers from every industry will value. From dealing with customers and delivering outstanding customer service, to time management and organisation, your experience will be invaluable! 5. High demand for jobs – this is an industry that is growing and is forecast to keep on growing. If you do a study programme in this area you know that with hard work and the right attitude it’s likely you’ll find work in the industry when you graduate. Our tutors are experts. They have worked out in industry and know what skills employers are looking for in young people, meaning they can give you that cutting edge you need when you start looking for jobs. We have the best facilities in the area. Whether it’s our life-size plane simulator or our airport security desk, you’ll get a taste of what doing the job is actually like, nothing will you prepare you for your future career better. Click here to check take a 360 tour of our airplane cabin. Our staff work hard to provide you with the best experience possible. Whether it’s giving you the opportunity to compete locally and nationally, going on trips to East Midlands Airport, Amsterdam or Morocco, visiting airlines such as Thomas Cook for safety training, or attending special seminars and lectures held by companies in the industry, you’ll know you’ll be getting the best experience possible. Our aviation, travel and tourism department has some fantastic links with local and national industry employers, so we can help you to gain work experience to contextualise your studies and boost your CV. We currently work with national organisations including Premier Inn, British Airways and Leeds Bradford Airport, and also more local venues such as Sheffield City Hall. We try to give you as much real-life experience as possible so that you feel prepared for the next step, whichever direction that might be in. The aviation, tourism and events sector encompasses a huge variety of job roles, and employment opportunities are increasing. 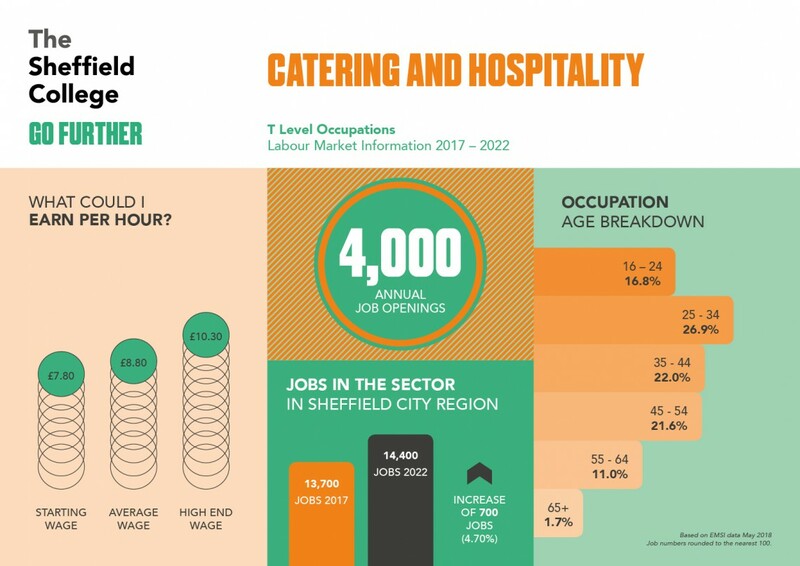 In the Sheffield City Region alone there are 2000 job openings in this industry, and of course working in travel means that you can take advantage of vacancies all over the world, not just the ones on your doorstep. In the UK, the average salary for people working in this industry is £21,522, but with global companies like British Airways in the mix, your earning potential could be much more! You can find more information about local job opportunities and how they match up with our courses on our Career Coach site. "I loved all my tutors, they just wanted you to do well in college and your chosen career. My air cabin crew tutor had previous experience with an airline so she knew first-hand about the industry."